Þyrnar (fræðiheiti: Crataegus, úr grísku orðunum kratos „styrkur“ og akis „hvass“, sem er vísun í þyrna sumra tegundanna) er stór ættkvísl runna og trjáa í rósaætt, ættuðum frá tempruðum svæðum norðurhvels í Evrópu, Asíu og Norður Ameríku. Fjöldi tegunda ættkvíslarinnar fer eftir hvaða reglum flokkunarfræði er farið eftir. Áður fyrr töldu sumir grasafræðingar tegundirnar vera yfir 1000, margar hverjar örtegundir geldæxlast. Raunhæfari tala er um 200 tegundir. ↑ J. B. Phipps (1997). 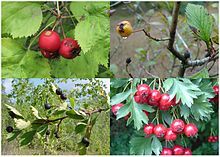 Monograph of northern Mexican Crataegus (Rosaceae, subfam. Maloideae). Sida, Botanical Miscellany. 15. Botanical Research Institute of Texas. bls. 12. ISBN 9781889878294. ↑ Voss, E. G. 1985. Michigan Flora: A guide to the identification and occurrence of the native and naturalized seed-plants of the state. Part II: Dicots (Saururaceae–Cornaceae). Cranbrook Institute of Science and University of Michigan Herbarium, Ann Arbor, Michigan. ↑ 5,0 5,1 Graves, Robert. The White Goddess: A Historical Grammar of Poetic Myth, 1948, amended and enlarged 1966, New York: Farrar, Straus and Giroux. ↑ Palmer E.J. (1925). „Synopsis of North American Crataegi“. Journal of the Arnold Arboretum. 6 (1–2): 5–128. ↑ Phipps, J.B., O'Kennon, R.J., Lance, R.W. (2003). 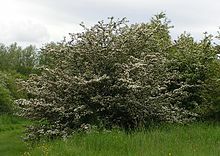 Hawthorns and medlars. Royal Horticultural Society, Cambridge, U.K.
Þessari síðu var síðast breytt 4. mars 2019, klukkan 22:12.